Platinum futures are traded through commodities contracts on the New York Mercantile Exchange (NYMEX), the Chicago Board of Trade (eCBOT) and the Tokyo Commodity Exchange (TOCOM). 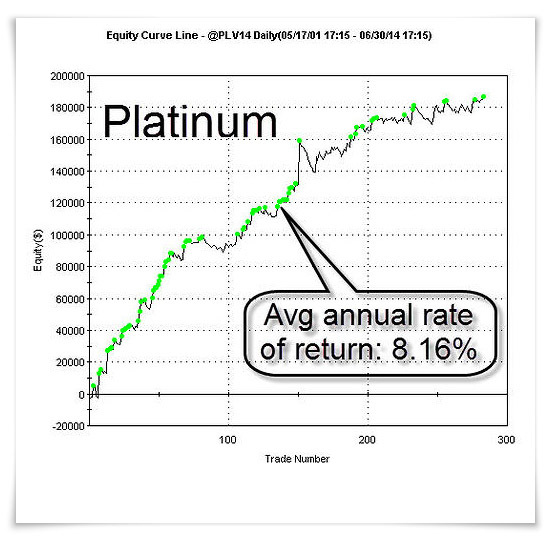 This mechanical trading strategy utilises the CBOE Gold Index ETF as a leading indicator for buying into Platinum. A number of other variables are factored in eg: Stops set according to previous Highs and Lows, Trailing Stops, Liquidity/Volume, etc. The results in the two diagrams below are based on a $100,000 initial capital investment and factors in commission and slippage deductions. The Platinum strategy is our only commodity based strategy that can be traded with a smaller account ie: $50 000 account. The Gold futures contract is traded through commodities contracts on the COMEX division of the NYMEX. There are two main trading periods for Gold, the Pit Trading session from 8:20am EST through to 1:30pm EST and the electronic platform from 6:00pm EST through to 5:15pm EST. We currently have three active Gold strategies in operation with each strategy similar to the other, however each one has a unique set of rules which creates a “diversified edge”. To mitigate risk and improve upside potential we only trade the top Gold performing strategy (based on a ratings scale over the past 12 months) of the three strategies. These mechanical trading strategies activate on a specific set of Trend Trading rules that occur over several days. When these rules check all the boxes, we will then take a long position at predetermined entry price. The individual strategies have performed far better in bull market periods and they only operate on Long Trades, which have yielded consistent equity gains over the past 13 years. 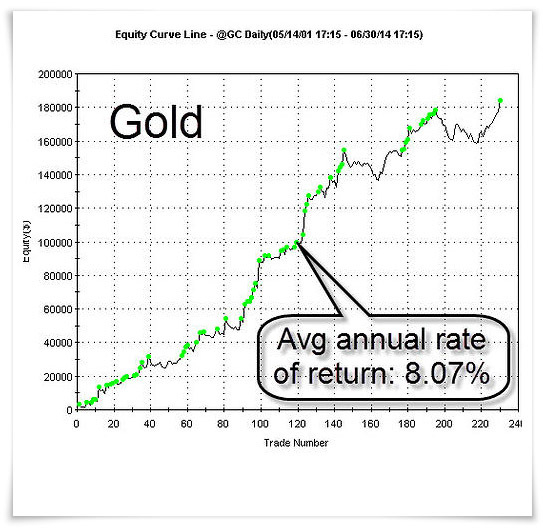 In the current commodity bear market the three diversified Gold trading strategies are mitigating the impacts of any potential negative returns. Strengthened by fixed risk stop losses and sizeable upside potential (please see below stats), these strategies are well worth the long term investment. With the use of trailing stops, we are able to slowly lock in our profits and ride the trend through to a profitable outcome. The results in the two diagrams below are based on a $100,000 initial capital investment and factors in commission and slippage deductions. These Gold strategies are recommended to clients who have large capital accounts. Smaller capital accounts have yielded poor results due to the strict risk management structure and factoring in commission and slippage fee’s associated to these trading strategies. The Silver futures contract is traded through commodities contracts on the COMEX division of the NYMEX. There are two main trading periods for Gold, the Pit Trading session from 8:25am EST through to 1:25pm EST and the electronic platform from 6:00pm EST through to 5:15pm EST. Similar to Gold, we currently have three active Silver strategies in operation with each strategy similar to the other, however each one has a unique set of rules which creates a “diversified edge”. To mitigate risk and improve upside potential we only trade the top Silver performing strategy (based on a ratings scale over the past 12 months) of the three strategies. These mechanical trading strategies activate on a similar set of Trend Trading rules as Gold and also run over several days. When these rules check all the boxes, we will then take a long position at predetermined entry price. The individual strategies have performed far better in bull market periods and they only operate on Long Trades, which have yielded consistent equity gains over the past 13 years. In the current commodity bear market the three diversified Silver trading strategies are mitigating the impacts of any potential negative returns. Strengthened by fixed risk stop losses and sizeable upside potential (please see below stats), these strategies are well worth the long term investment. With the use of trailing stops, we are able to slowly lock in our profits and ride the trend through to a profitable outcome. The results in the two diagrams below are based on a $100,000 initial capital investment and factors in commission and slippage deductions. 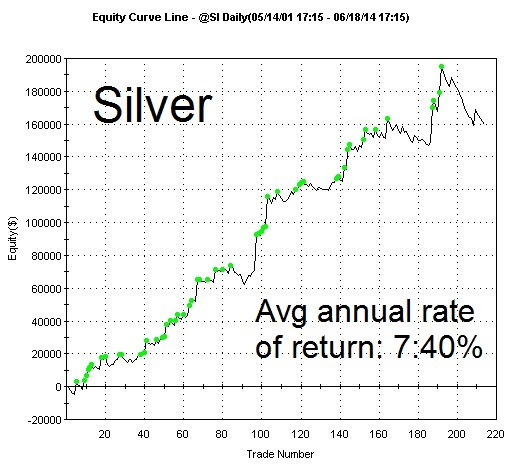 These Silver strategies are recommended to clients who have large capital accounts. Smaller capital accounts have yielded poor results due to the strict risk management structure and factoring in commission and slippage fee’s associated to these trading strategies. a safe 2% of your portfolio on a trade even if you have never traded before.